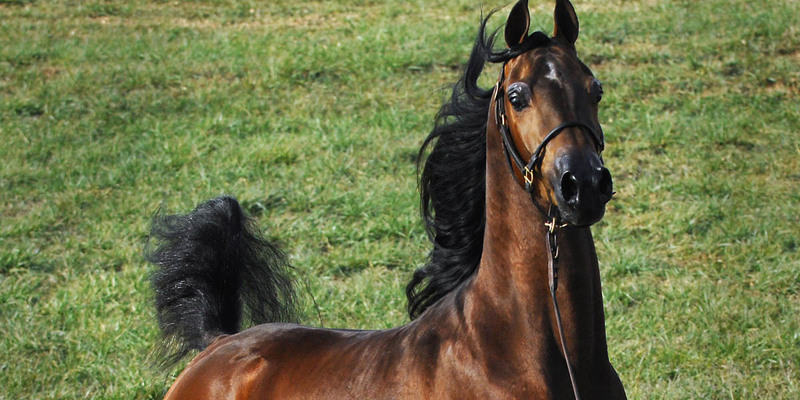 U.S. Top Ten English Pleasure BASKGHAZI comes from one of the most successful pedigrees in Arabian saddleseat breeding, combining BASKE AFIRE, AFIRE BEY V, *EL GHAZI and LE FIRE, all sires of National Champion saddleseat competitors. He has lived up to the promise of his pedigree with his get, including 2014 U.S. Reserve National Champion English Pleasure Futurity SUPREME SENSATION SMP, 2014 U.S. Top Ten Country Pleasure Futurity BLOCK BUSTER PF, and 2014 U.S. Top Ten Country Pleasure Select ATR BASKGLORY. BASKGHAZI is a 3/4 brother to twice Canadian National Champion English Pleasure Junior Horse SIN CITY, to U.S. Reserve National Champion Pleasure Driving AOTD CARD SHARK, and U.S. Reserve National Champion Country Pleasure MBF BURNING SPRINGS, all also by BASKE AFIRE out of daughters of *EL GHAZI. BASKGHAZI is a maternal brother to U.S. National Champion Park and Top Ten Stallion and National Champion sire IXL NOBLE EXPRESS+, and to U.S. Reserve National Champion English Pleasure Futurity and 2012 Scottsdale Champion English Pleasure H MOBILITY H. He is also a maternal brother to the National winner producers IXL SAPHIRE and IXL MISS FIREFLY. He is a 3/4 brother to multi-Top Ten English Pleasure and National Champion sire VCP MAGNIFIRE, who is by his paternal grandsire AFIRE BEY V out of his dam RY FIRE GHAZI. BASKGHAZI’s sire BASKE AFIRE has only been shown once, when he was named Scottsdale Champion Country Pleasure Driving. He has a superb record as a sire, with 319 purebred and Half-Arabian champions from 393 shown get, giving him a remarkable percentage of 81% champions from his shown foals. He has sired 159 purebred champions, 45 of them National winners, and 160 Half-Arabian champions, 79 of them National winners. BASKE AFIRE was the leading performance sire of the 2011 U.S. National Championship show. His 25 purebred 2011 National winners include Canadian Top Ten Mare and Park MAJORCAS FIRE, multi-Top Ten English Pleasure SOMMELIER, multi-Top Ten Park GLACIER FIRE, U.S. Reserve National Champion English Pleasure AOTR 40/Over BASKE ALLIENCE, Country Pleasure National Champions MBF BURNING SPRINGS, THE WAY SHE MOVES+, BONFIRE ROF, PRINCE OF AMES, GLITTERATI, BASKE ALARM, and PRINCESS OF BASKE, and Top Ten winners in hunt pleasure and show hack. BASKE AFIRE is a son of U.S. Top Ten Park AFIRE BEY V, the breed’s all time leading sire of champions who has 661 purebred and Half-Arabian champion get through February 2012, including 528 purebred champions, 249 of whom have National titles. AFIRE BEY V is by U.S. Reserve National Champion Futurity Colt and English Pleasure HUCKLEBERRY BEY++, sire of 104 National winners. 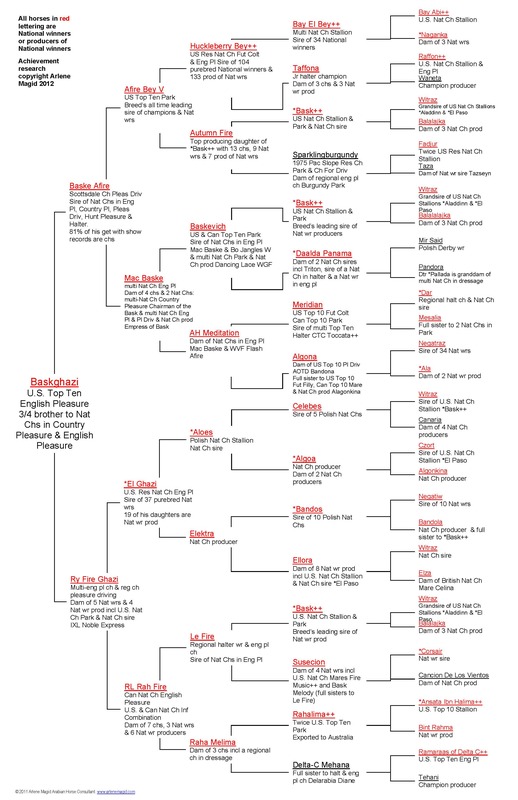 His dam AUTUMN FIRE is the top producing daughter of U.S. National Champion Stallion and Park *BASK++, with 13 champions, 9 National winners and 7 National winner producers among her offspring. A great stallion must come from a strong dam line, and BASKE AFIRE’s dam line has produced National winners for four generations. BASKE AFIRE’s dam, pure Polish MAC BASKE, is a multi-National Champion English Pleasure herself. She has produced 4 champions, 2 of them National Champions: multi-National Champion Half-Arabian Country Pleasure CHAIRMAN OF THE BASK and multi-National Champion English Pleasure and Pleasure Driving and National Champion producer EMPRESS OF BASK. MAC BASKE is by U.S. and Canadian Top Ten Park BASKEVICH, sire of National Champion English Pleasure BO JANGLES W and multi-National Champion Park and National Champion producer DANCING LACE WGF. MAC BASKE’s dam is AH MEDITATION, also dam of National Champion English Pleasure WVF FLASH AFIRE. Her sire MERIDIAN is a National winner in halter and park and a National winner sire, and her dam ALGONA is a National winner producer and a full sister to multi-National halter winner and National Champion producer ALAGONKINA. BASKGHAZI’s dam RY FIRE GHAZI is a multi-english pleasure champion and regional pleasure driving champion. She is the dam of 5 National winners (the fifth not yet mentioned is Canadian Top Ten Half-Arabian Country Pleasure JOTR AGRAND AFIRE). Four of her offspring have produced National winners. RY FIRE GHAZI is by U.S. Reserve National Champion English Pleasure *EL GHAZI, sire of 37 purebred National winners including National Champions in English pleasure, country pleasure, country pleasure driving, show hack, western pleasure and halter. 19 of his daughters have produced National winners including National Champions in halter, hunter over fences, dressage, country pleasure, country pleasure driving, English pleasure and park. *EL GHAZI daughters produced 9 National winners in 2011. RY FIRE GHAZI is a full sister to 3 National winner producers: RAHELLE (dam of U.S. Top Ten English Pleasure Futurity TIGER EQ), HARGHAZI FIRE CMF (dam of Canadian Top Ten Hunt Pleasure Junior Horse RAH FIRES LEGACY CMF), and RAHGHAZA (dam of 2011 U.S. National Champion English Pleasure JOTR 14-17). RY FIRE GHAZI’s dam RL RAH FIRE is a U.S. and Canadian National Champion Informal Combination, Canadian National Champion English Pleasure and U.S. Top Ten English Pleasure winner. She produced dam of 7 champions, 3 National winners and 6 producers of National winners. Her National winners include four times Top Ten Country Pleasure RAHELLE, U.S. and Canadian Top Ten Country Pleasure Driving and National winner producer RAH CANADIAN, and U.S. Top Ten Country Pleasure AOTR 18-35 and Country Pleasure Driving and regional winner sire RFIRETOI CMF. RL RAH FIRE comes from three generations of successful saddleseat performers. Her sire, regional halter winner and English pleasure champion LE FIRE, sired 16 National winners, among them English Pleasure National Champions TF TOTALLY KOOL+++. FIRENELLA, Country Pleasure National Champions BREATHIN FIRE, GFI CHRYSTAL FIRE+ and GFI CHARADE, multi-National Champion Dressage FIRES KLASSIC , and multi-National Champion Pleasure Driving KOOL FIRE++/. He was a noted broodmare sire whose daughters have produced National Champions in halter, English pleasure country pleasure, hunter and hunt pleasure. RL RAH FIRE’s dam RAHA MELIMA produced 3 champions. 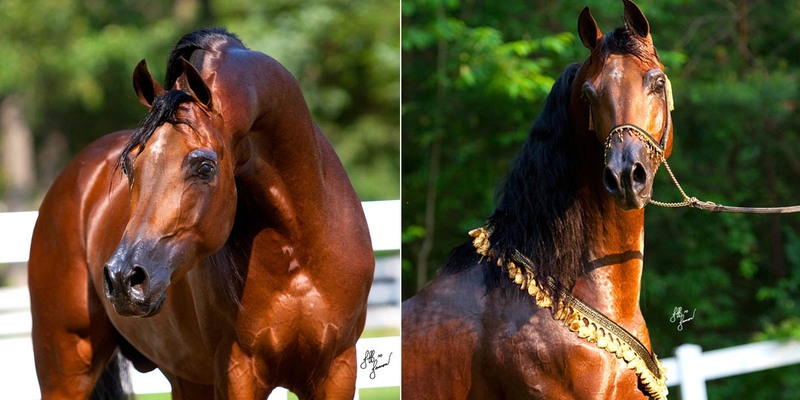 She represents an Egyptian/Crabbet cross, as her sire RAHALIMA++ is a twice U.S. Top Ten Park Horse sired by three times U.S. Top Ten Stallion *ANSATA IBN HALIMA++, the only Egyptian import to sire both a U.S. National Champion Stallion and Mare. Her dam DELTA-C MEHANA is by U.S. Top Ten English Pleasure RAMARAAS OF DELTA C, whose sire RAMINAGE sired National Champions in park and native costume and Top Ten winners in halter. Thus BASKGHAZI is bred for many generations to be the excellent athlete he is.